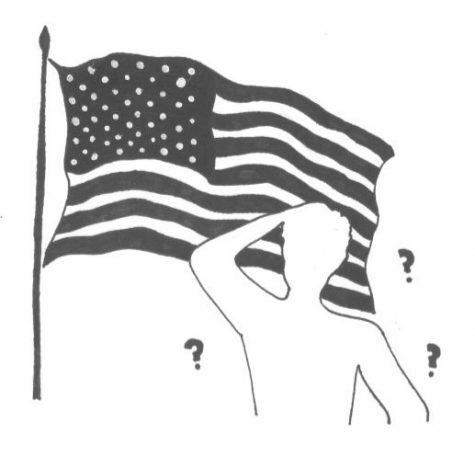 The Pledge of Allegiance: nationalism or patriotism? Whenever the announcements ask me to stand for the Pledge of Allegiance, I do so with apprehension at best and stand awkwardly silent, while the rest of my class says the Pledge in a monotonous voice. I understand that the Pledge is supposed to be patriotic, but there seems to be a nationalistic vibe surrounding it. We need to ask ourselves: why do we say the Pledge? Because of an undying loyalty to the United States? Or because we’ve just done it for so long that it has just become part of our daily routine? Maybe because it’s been part of our daily routine since kindergarten that the Pledge of Allegiance has become too nationalistic. Teaching kids from a young age to pledge their loyalty to a country that they barely understand screams social conditioning. We all know young kids are impressionable—so why try to impart American exceptionalism when they don’t really know what it means to be an American? Comprehending America isn’t even half of it. Teaching impressionable kids to blindly follow the American government from such a young age is complete indoctrination. It’s taking kids and molding them to be an exclusive American patriot. I’m not saying it’s socialization to love America, but it does seem to become a tad nationalistic when we’re teaching them undying loyalty to a government. In addition to the strange nationalistic vibe that comes from the Pledge, there lies two words that, in all honesty, describe why we shouldn’t be standing for the pledge: “Under God.” This isn’t criticism of religion at all, but including this line seems discriminatory. Sure, students don’t have to say anything, but it does send a message of the expectation of a state religion.The Pledge is more of a relic than an American tradition that should be quoted every day. Drilling nationalistic messages to the young while subliminally sending messages encouraging state-sanctioned religion is not what America is supposed to stand for.